The full size luxury seven-seater SUV space is still waiting to be filled by products that are affordable, efficient and provide great value. Until yesterday, there were barely any players. At the lowest end of the price segment, there is the Mahindra XUV500. In the middle, there is the Toyota Fortuner which continues to be a benchmark product. And then the next best thing you could get that held seven passengers inside its cabin was somewhere up in the Rs 50 lakh- plus bracket. 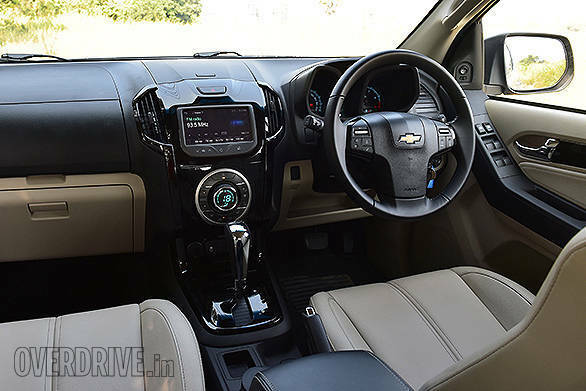 Just a month ago Chevrolet presented the Trailblazer, priced at Rs 27 lakh for a single LTZ variant and very soon we will have Ford bringing out the new Endeavour. Both are American products, developed for Asian and Australian markets and should make a sufficient impact in the Indian market. 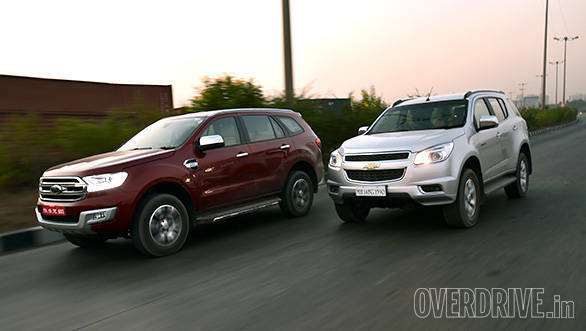 But which of these should you focus your attention on the most, the Chevrolet Trailblazer or the Ford Endeavour  let's find out. 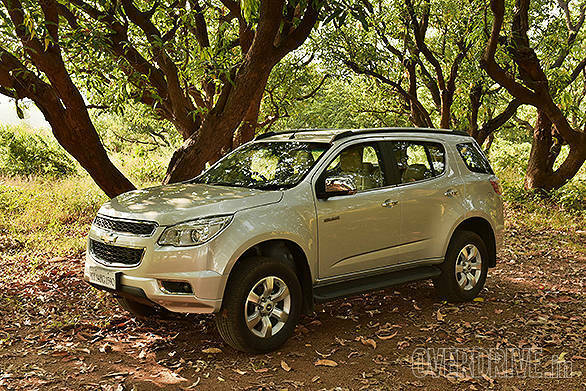 The Chevrolet Trailblazer is clearly all about size  big, bulky and intimidating or imposing  whatever fits the bill. It's got a huge face, a massive grille on top of which sits above a massive bowtie. The headlamps and tail lamps are large units, the bonnet is large; the height, width, length and ground clearance are huge. Everything about this SUV spells L-A-R-G-E! And that is not a bad thing because there are several customers who like it kingsize. I can already see the Trailblazer being fairly popular in a slightly rudimentary political class, twenty rungs below the top echelons of power. That it is also priced at a reasonably affordable 'don't-draw-the-taxman's-attention'-Rs 27 lakh ex-Delhi further encourages its popularity within the said political class. While conducting the comparison test, I had two Fortuners, with a bunch of surly looking fellows decked all in white (like that's going to present you in a clean image), strings of gold chains, fake (or maybe the real deal) gold Rolexes and fat rings, drive up to the Trailblazer. On both occasions, they wanted to know only the price and surprise, surprise  the size of the engine! Of course, they also enquired about the Endeavour which, seconds later, appeared more attractive to them. What the Chevrolet Trailblazer is not, is good looking. It's imposing and that size lends it a certain personality. It has got broad shoulders, muscular haunches and a sense of ruggedness that is appealing. Otherwise, there are just large panels with minimal sculpting and some simple gouges and cuts to provide some visual relief. The Trailblazer, thankfully and quite humbly, is not a poser  this is a workhorse SUV, a sort of a farmhand, with little or no sense of style or fashion. In fact, from the overall silhouette, you clearly get the sense that the design is a bit outdated, something that was in vogue back in the mid-2000s, but is now out of place a decade later. The most obvious indication of that is the tilting upward window line with the thick D-pillar and the wraparound effect to the rear window. These are all bits of an old school design element which pale in comparison to the new Ford Endeavour. The new Ford Endeavour is all about raging hormones and putting on your snazziest threads, in an age when everything you wear happens to be snazzy! It's definitely a huge change from the boxy Endeavour of old  in fact, there isn't one hard edge or crease or bend to be found anywhere on this SUV. 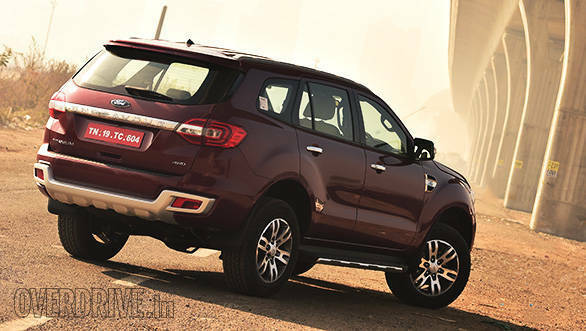 The new Ford Endeavour has got curves and soft edges which are definitely more appealing to look at compared to the Trailblazer. From the front end to the rear, the new Ford Endeavour looks sleeker than ever, and surprisingly, it's not much smaller in dimensions than the Trailblazer. In fact, it's longer but narrower and slightly shorter than the Trailblazer. 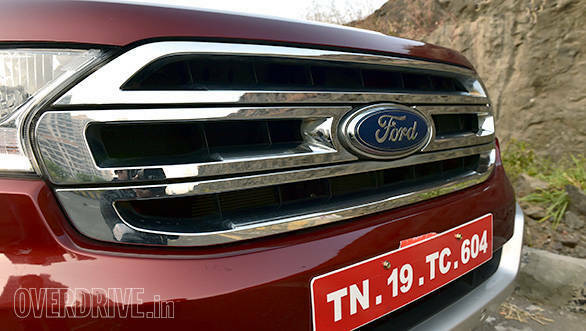 And make no mistake, the Ford Endeavour also has the same affinity for large ornamentation, whether it's the hue headlamps or the big grille with the large Ford logo stuck to the centre and the large fog lamps on an equally huge bumper. Nothing on this SUV spells 'petite' and yet there is a remarkable sense of dynamism that erupts from the design. Where the Trailblazer looks a bit ponderous, the Endeavour appears to be full of vigour and energy. 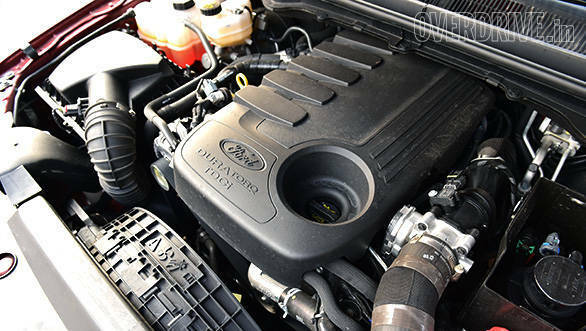 Ford also has two variants of the Endeavour, one powered by a 2.2-litre engine and the other by a 3.2-litre engine. The only way of telling the two apart is by a small badge on the front fender which clearly denotes the engine capacity. Otherwise, there is physically no way of distinguishing one from the other. 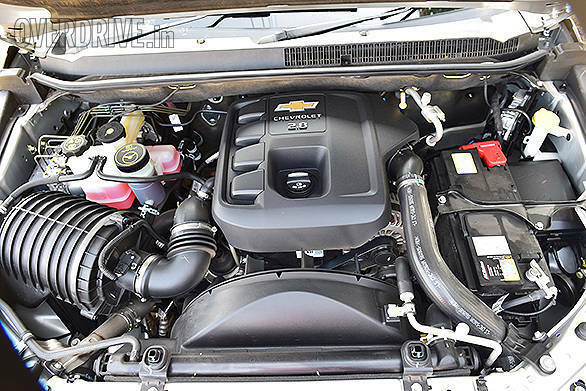 The Trailblazer comes with just one engine, a four-cylinder turbocharged diesel that displaces 2,776cc called the Duramax. That engine size is a disadvantage for the Trailblazer given the current environment in Delhi with its anti-2000cc diesel engine stance. The ban on registrations may be temporary but it's an absolute pity because this is an engine the Dilliwallas would have loved to drive. It makes a reasonably capable 200PS of max power but has an enormous 500Nm of max torque which puts it in the league of several significantly more expensive SUVs. Max power kicks in at 3,600rpm while max torque makes an appearance at 2,000rpm which is a bit high. The Trailblazer's diesel uses a variable geometry turbocharger with dual overhead camshaft architecture. To reduce interior noise and improve overall NVH, it also uses a balancer shaft to damp engine vibes. At low speeds you can hear a dull throb synonymous with diesel engines and it progressively gets louder as the revs increase, but it is never disturbing or too loud. The engine is mated to a 6-speed automatic transmission that offers both automatic and manual modes along with a Sport mode. In Sport mode, the ECU alters the shift points of the Trailblazer so you're able to utilise the entire torque and power spread. The engine is responsive with hardly any turbo lag, but you have to step hard on that throttle pedal to get a sense of the 500Nm. Gentle throttle actions make this engine feel lethargic and lazy, but stab the throttle pedal hard and the power is explosive. The Trailblazer on our test runs did a 0-100kmph in just 9.8 seconds (in Sport mode) which is blazingly quick for an SUV that weighs a little over 2 tonnes. In gear, acceleration or kickdowns are also urgently dispensed with, the Trailblazer barely having to drop a gear to get in the thick of things. The performance advantage also comes through because of its 2WD drivetrain which accounts for fewer mechanical parts and lower weight that results in better efficiencies. 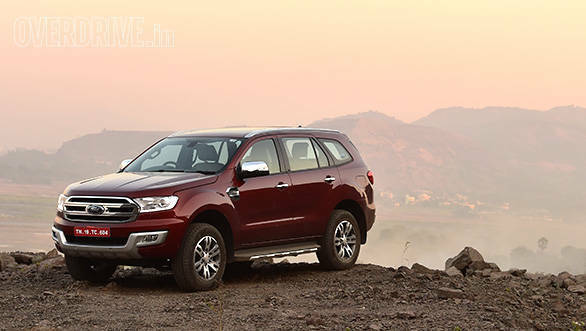 The Ford Endeavour will also face issues in Delhi like the Trailblazer since both its engines are well above the 2.0-litre mark. There is, however, the rest of India to cater for and I think offering two engine options with multiple transmission and drivetrain options is a smart way to go. Ford India will in fact be offering two trim levels spread across three specification sets. On our tests were the 2.2-litre and the 3.2-litre Titanium variants clubbed with the 6-speed automatic transmission. 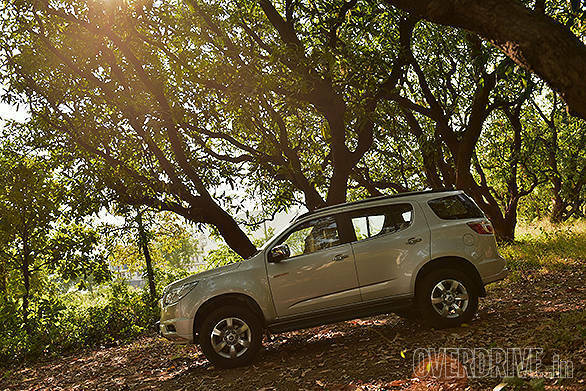 The 2.2-litre is what we directly compared with the Trailblazer since it too has a 2WD drivetrain. The 2.2-litre turbocharged diesel displaces 2,198cc and is capable of generating 160PS of max power at 3,200rpm with 385Nm of max torque right from 1,600-2,500rpm. The Endeavour power ratings don't exactly reside in the same territory as the Trailblazer but the max torque comes in earlier and stays on longer, a mechanical advantage that provides better driveability and efficiency. On our tests runs, the 2.2-litre diesel did the 100kmph run in some 13 seconds while the much more powerful 3.2-litre (200PS max power and 470Nm torque and 4WD) did the same in 11.1 seconds. One interesting aspect that we noticed in the course of the tests, the 2.2-litre Endeavour would have been significantly quicker if it had let us raise the engine revs to around 2,000-2,500rpm allowing us to stay in the power band when we shot off. When we attempted that, the ECU would not allow the transmission to upshift, holding the needle against the rev counter for much longer than anticipated. This was in Drive and Sport mode, while in manual mode, the transmission would simply skip a gear and go into third directly from first. On the standing starts, all we could do was start with a flat rev counter, it then takes the Endeavour a few seconds to shoot up into its power band and pick up pace. 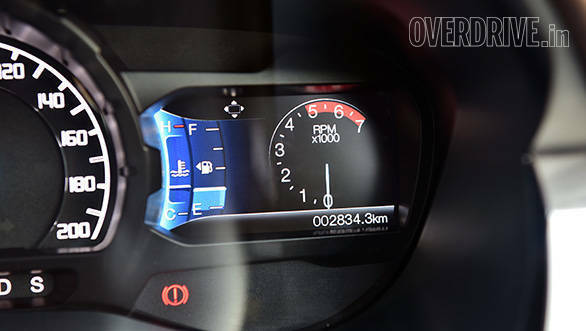 The 3.2-litre Endeavour had none of these complications. The Endeavour though feels much easier and more linear to drive than the Trailblazer. The engine responses feel quicker and silkier, there is little to no turbo lag, driveability is better and even NVH is superior. In fact, in an effort to reduce in-cabin sound, Ford's audio system emits a noise cancelling wave that blocks out the engine clatter. And this is quite an impressive technique since there is barely any engine noise in the cabin  at idle and even slightly higher rpms, it almost sounds like a petrol engine under the hood. Overall then, the Endeavour has the nicer and friendlier engine that isn't explosive and dramatic but fits well in ordinary circumstances. The Trailblazer needs to be worked hard to be rewarding otherwise it can be quite tedious and laborious. On our tests the Chevrolet Trailblazer returned 8.3kmpl in the city, 12.1 on the highway resulting in an overall 9.25kmpl. That isn't too bad a figure considering this SUV weighs 2,068kg and is an automatic. However, driving home from work the night before the comparison test, the live fuel meter never showed anything more than 8.7kmpl which again in Mumbai's stop go traffic is quite impressive. The 2.2-litre Endeavour returned 11.2kmpl on the highway while the 3.2-litre variant showed a fuel efficiency of 9.15kmpl. Both the Trailblazer and the Endeavour resort to old school chassis layout, utilising body on frame constructions. There is, however, a world of difference in the ride quality, comfort, dynamics and stability each has to offer. The Trailblazer has an independent setup at the front with double wishbones at the rear. However, ride quality is far from desirable. The suspension crashes into every surface deformity very harshly, there is an immense amount of body roll and even small surface undulations result in a very bumpy ride. The steering is quite hard in feel though very direct. At either low or high speed conditions, there is a lot of effort required to use the steering wheel. That's because this is a standard hydraulically assisted system without any electronic assist. At high speeds, this isn't much of an issue, at urban crawl speeds the steering can be exhausting. And given that this SUV will largely be used in the city, that steering could have been lighter. On the handling front, there is an enormous amount of body roll, however, on the move the Trailblazer feels quite stable. Even at high speeds while minor undulations are also transmitted to the occupants, there isn't a moment you feel like the Trailblazer isn't securely planted. It may not seem very confident but given the high centre of gravity, it still feels perfectly poised for most tasks. The Trailblazer uses disc brakes all around supported by ABS and EBD. There is also a whole array of dynamic safety nets like traction control, stability control, hill descent, hill start controls and several more to keep the Trailblazer and its occupants out of trouble. The Ford Endeavour in comparison is worlds apart. It too has a similar suspension layout to the Trailblazer but the ride comfort it provides is unparalleled for a vehicle with a body on frame chassis. It feels no different from a monocoque, especially in the way the suspension absorbs everything easily and the body feels taut and rigid throughout. Body roll is highly controlled despite the 225mm ground clearance and the height leading up to an equally high centre of gravity. Handling also is very impressive and the Ford Endeavour feels superbly neutral when pushed hard around corners. No theatrics or drama headline this SUV and it goes about in high Dynamic mode or as urban runabout with unprecedented stability and confidence. Steering effort is light and easy for in-city commutes and the weight adds up as the speeds increase. But it does not possess the directness of the Trailblazer. Both SUVs also ride on 265/60 R18 tyres but work very differently. 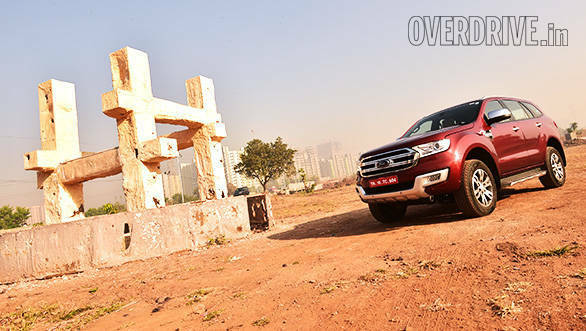 The Endeavour feels like it offers higher grip levels compared to the Trailblazer though neither tyre provides any advantages to ride quality which is now entirely up to how the suspension in either SUV is set up and behaves. The Trailblazer is huge on the inside but its advantage comes from its height and width. The plus-two-metre width and 1.85-metre height give it a good space advantage over the Endeavour. Both these SUVs seat seven passengers over three rows. Normally third row seats aren't ideal for adults but both don't have that issue. 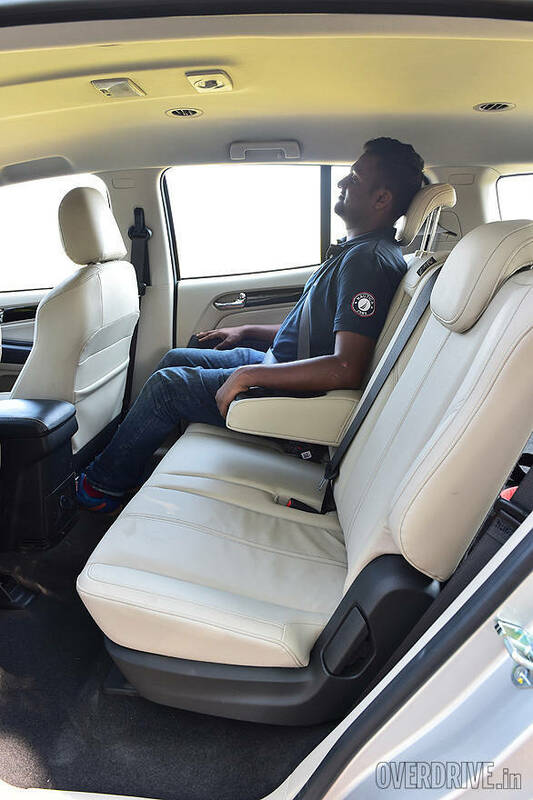 The last row will comfortably seat two adults or three kids though they'd be most comfortable over short trips rather than longer outstation drives. The Trailblazer is slightly better because it has a lower floor and a higher roof. It is also easier to access its third row  the second row tumbles forward completely. The Endeavor's middle row slides forward to make space for the third row. But the slide mechanism also prevents the forward tumble so rear access is a bit harder. 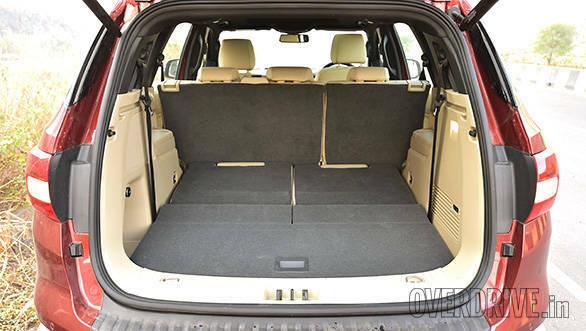 The Ford's mid-row does fold flat, however, so when you need more room for cargo, the Endeavour is very much ON it. Features such as power tailgate and sliding second seat row come as standard on all variants. Also, the 3.2-litre Titanium variant gets a power adjustable third row seat, which makes the last row go flat at the touch of a button. In addition, it gets panoramic sunroof too. Once you're seated, both cars offer vents for each row of seats. But the Ford goes one better by offering temperature controls for each row too. 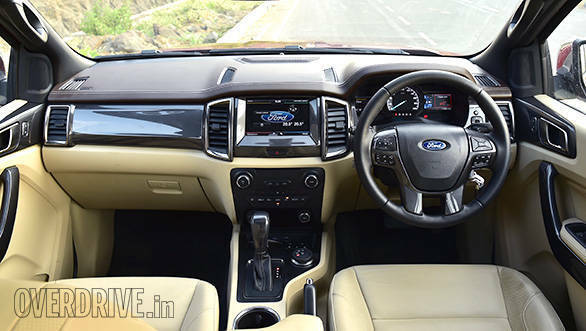 The Ford also has a fuller features list offering a larger touchscreen infotainment system which has a better user interface with Bluetooth, USB and aux on all variants. Sync, Ford's well-appreciated app and the MyKey which allows you to set driver profiles for the family's drivers are both standard as well. The Chevrolet's feature list is by no means a short one but while it does also get a touchscreen system, the only place it stands out against the Ford is by offering Isofix points for child seats and a crash sensor that unlocks the doors if it detects a crash. Unfortunately, this does little to enhance the Trailblazer's safety credentials because the base Endeavour matches the Trailblazer's safety spec while the price-competitive variants have four or five more airbags, all told. 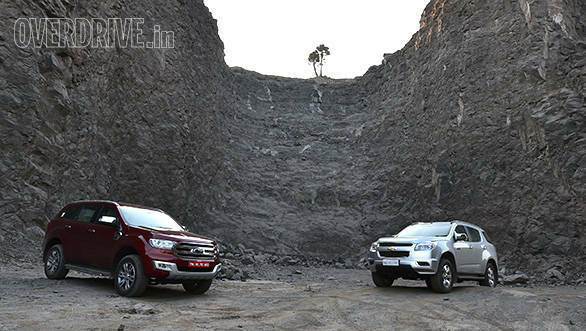 The Ford Endeavour and Chevrolet Trailblazer are similarly positioned SUVs. The Ford scores more points over the latter on multiple fronts, however. The Chevy Trailblazer looks massive and that's going to attract a certain class of customer to whom size does matter. The Ford's parry is a more modern design and that's persuasive too, especially given that the Endeavour isn't a small SUV by any stretch of the imagination. Ford has bid farewell to the boxy and dated lines and has gone in for a very urbane and sophisticated design. The Endeavour cabin is more premium and has a long list of features. The Trailblazer doesn't come with as many gizmos but it offers more space. Ford gets more points for offering a larger range of options. The Endeavour has three trims, two engines with two- as well as four-wheel drive versions on offer. Chevrolet offers you the choice of taking the two-wheel drive automatic LTZ version or leaving it. Both SUVs sit on ladder frames but the Ford is tuned to drive and handle a lot more like a car than the Chevy. The Trailblazer sticks to the typical American pickup truck dynamics rulebook showing substantial body roll. 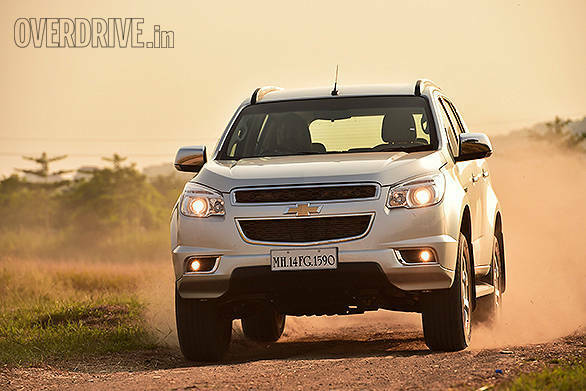 Chevrolet has priced the Trailblazer at Rs 27.40 lakh ex-Mumbai. That's a good price for the feature set the Trailblazer has. Unfortunately for Chevrolet, Ford will probably price the Endeavour lower. We expect the prices to start at Rs 20-22 lakh for the the Trend 2.2 MT 4x2 and hit Rs 27 lakh for the top-flight Titanium 3.2 AT 4x4. The Rs 60,000-odd (our estimate) that you will shell out is very easy to justify, not just on the Endeavour's merits but the fact that it has four more airbags than the Trailblazer. The Endeavour, unless Ford pulls out a massively big price tag, is the winner here. But the war hasn't even begun yet in this segment. The elephant in the room is the Toyota Fortuner which is set to be replaced by an all-new car. That's the vehicle that dominates the numbers in this segment and that's the car the Ford (and the Chevy) have to take on. If the new Fortuner arrives loaded to the gills like the international models, then the price will creep up from its present Rs 24-27 lakh range. Then it becomes a two pronged question. First, is the new Toyota better than the new Ford? And second, has the Toyota's price creep left an Endeavour sized hole in the room?